It’s New Year’s Eve, and my bus ride home from work was beautiful at sunset. I was among all the city’s people but getting ready to disappear like a periwinkle into my apartment, not to emerge again until 2015. I have a small stable of navel-gazing tumblrs that exist to keep me from being maudlin on Facebook. I don’t promote them, and sometimes months go by when I just re-blog images from other people and don’t write a jot. I enjoy the feeling that these tumblrs are lost in the forest of the Internet. One is called Mining Transport. It’s New Year’s Eve, I got a little reflective, and I tumbled again. This review originally appeared over at Newsarama, where I am a member of the Best Shots team! She-Hulk #11 shakes off all that courtroom civility and devotes itself to a knockdown, drag-out brawl. Muntsa Vicente’s joyful colors are more important than ever in this physical, sprawling issue. Inside the big fight, writer Charles Soule fits a smidgen of plot advancement, a sprinkling of class themes, and a reveal as the story circles back to the blue file. But this second-to-last issue mostly just feels like artist Javier Pulido’s explosive celebration of this team’s She-Hulk run, and it is wonderful. On the first page of She-Hulk #11, Titania’s bright orange hair and magenta onesie-and-boots ensemble join the color party of Jen’s green skin and royal blue jacket. “Enough talking,” says Titania, just before hurling Jen through several brick walls. There are lots of great details, like how Jen loses one shoe and we see her splayed toes as she flies through the air. It’s fun to see these women with strong jaws and legs like tree trunks, fighting all over a mountain top in New Jersey. Hellcat and Volcana join in and then finally Angie descends in the Fantasticar. Pulido not only makes this five-lady pile-up really fun and silly, he also avoids making it feel exploitative or objectifying. Soule’s She-Hulk has been an enjoyable reunion of Marvel characters, but one of the best things about it has been the unassuming Angie, a new character who presented herself as a slightly eccentric but otherwise normal paralegal (with a pet monkey). Soule has hinted that there is much more to Angie than we’ve seen. Now that there is only one issue left before the end of this She-Hulk run, we have to wonder if we will ever really know who Angie is. She’s been a great part of Jen’s team, and it was fun to see a stout, frumpily clad person hold her own in a fight with giant glamazons like Titania in She-Hulk #11. Titania is a hired gun, but makes it clear to Jen that she holds a working-class grudge against Jen’s lawyer life. It feels like Soule used Titania’s anti-intellectual voice and an ultra-physical episode as an antidote to the three straight issues of lawyer banter that came before. This push and pull reflects the contrast between Soule’s dialogue and the art of Pulido and Vicente. The art comes in colors and shapes that are bright, bold, and simple enough for babies to latch onto and enjoy. I think it’s incredible, economical art that verges on design and goes straight down the hatch. Then Soule layers in his light, clever dialogue that is sophisticated in a whole different way. These two elements work together reliably to give the series its confident charm. Beneath the solid art and dialogue, She-Hulk has had less assurance in its plotting and structure. The reveal at the end of She-Hulk #11 shows that Soule really has been writing a 12-issue arc, and hopefully that will give readers a sense of closure. I think a 12-issue arc might have been a bit ambitious, though. With so many zany superhero cameos, and so many fun subplots to explore, this story spent more time taking a break from its main plot than it spent on the main plot. Even moving away or toward the Blue File storyline has been awkward sometimes, which disrupted my attention on the story as I wondered what was going on with the storytelling. For instance, the abrupt ending to She-Hulk #6 after Nightwatch’s visit left me wondering if an arc had just ended clumsily or if I was just confused. Soule, Pulido and Vicente are all very skilled, and the plot hiccups might lessen when the whole series is read in trade paperback form. With this team’s chemistry, they could roll out She-Hulk wallpaper of Jen and her friends chatting while grocery shopping, and it would be enjoyable. I would have welcomed another dozen issues, but it’s been fun watching She-Hulk unfurl in 2014. Whether you’ve been following along or not, I recommend She-Hulk #11 as a great standalone fight issue, with pages and pages of action to gaze upon. Batgirl #37: Why Did Everyone Act So Surprised? Batgirl #37 is the new creative team’s third issue and it is in keeping with the two issues that preceded it: Babs Tarr’s artwork is fun and fluid, but writers Cameron Stewart and Brendan Fletcher often feel like they’re straining to show how very modern and youthful Barbara’s new life is. The team seemed to be settling into a more relaxed groove last issue, but have hit a snag with Batgirl #37. This issue shows that this story forgets that innocent fun and reckless ignorance can be two sides of the same coin. Batgirl #37 starts off excitingly with a lot of bling and color – one set of beautiful women is being mean and wild in a fast car. Another set of beautiful women is being adorable and getting all dressed up to go out. Tarr’s apt cartooning keeps things light and airy, and the whole first half of the book reminds me in a happy way of the Katy Keene comics I read as a little kid in the 1980s – it’s aspirational in that basic way of little kids just wanting to be grown up and be popular, to own pretty things and have fun times. Like Katy Keene with her Broadway dreams and New York modeling career, it was easy to believe back then it was impossible to be sad if you were wearing high heels. 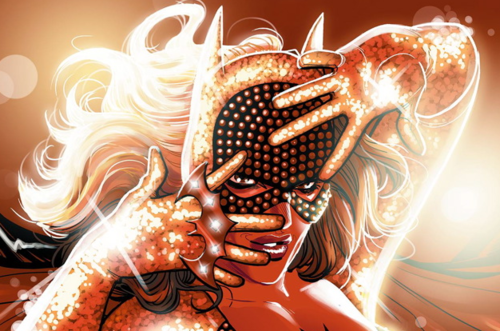 As Batgirl #37 progresses, there is more glitter, more snark, more pretty hairstyles and cute dresses. Fletcher and Stewart stand out in their ability to feather a lot of information into the panels so that you feel like you’re reading twice as many pages, but not in a way that taxes your attention span. They fill a scene at an art gallery with conversation, details, and texts as the characters move about noticing and reacting to the art. Maris Wicks’s bold and sometimes-clashing colors also ratchet the energy up and up and up. When Barbara finally fights her bedazzled impersonator, it might be meant as a commentary on our fame-obsessed consumer culture. But it feels more like a direct appeal to the Katy-Keene-reading me that was about eleven years old and didn’t yet have a fully formed frontal lobe. I’m okay with that. Batgirl gets itself in trouble when it tries to sell itself as being more progressive and more meaningful than it really is. Then things go bad, like at the end of Batgirl #37 when Barbara’s crooked impostor turns out to be a man and everybody laughs at how pitiful he is. The new Batgirl team set itself up by presenting itself as progressive-leaning, both in interviews and with some of its aesthetic and editorial choices. They gave Barbara a new, non-exploitative crime-fighting costume with flat boots and practical body-coverage. They gave her new, diverse friends, such as a bisexual woman of color who sometimes needs braces to walk, and a sassy girl in hijab. That’s great, but three issues in, it still feels like those types of decisions were breezily checked off a list by the writers. It often feels like the writers are batting around theme-like objects, but not exploring actual themes. We have been told that Barbara uses her brains to fight crime, but we see her getting all dolled up as online bait. We are told some of the characters might have reasons to feel marginalized, but all we see are normal, beautiful, hyper-stylish girls who travel in a pack. When the protagonists seem to sit so pretty, it signals to me that we are supposed to aspire to be them, not identify with them. And what exactly are we aspiring to that we shouldn’t already be able to see through? Meanwhile, the villain is clumsily painted to be a real transgressive weirdo with obvious weirdo ways: a mawkish, sneering, pathetic man who dresses up as a woman. On Saturday, the creative team publicly apologized for offending people with their treatment of the transvestite villain in Batgirl #37. The “queering the villain” incident wasn’t a mis-step to apologize for and move on from though, it was a symptom. In the context of this book, inviting people to laugh along with the protagonist at a transvestite made sense. Making fun of transvestites and transgender people is still accepted in our culture, and this Batgirl run is mainstream and uncritical. It can be enjoyed for the brightness of Babs Tarr’s work, or treated like a nostalgic pleasure. But if it is smart, it’s smart like advertising. There’s a lot of grown-up talent on this book’s new creative team, but they are only playing at making Batgirl an ode to girl power. Hey, sloth. What’s a sweetheart like you doing in a place like this? 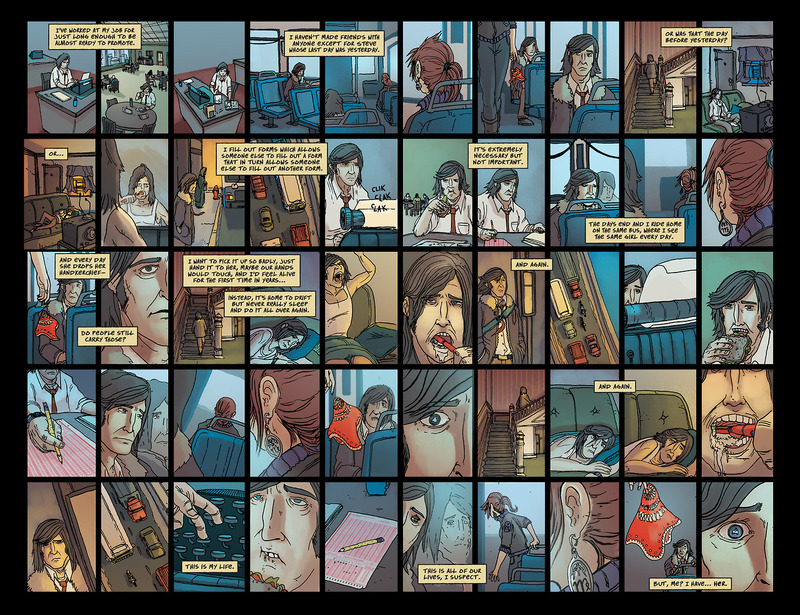 Memetic #2 (Published by BOOM! 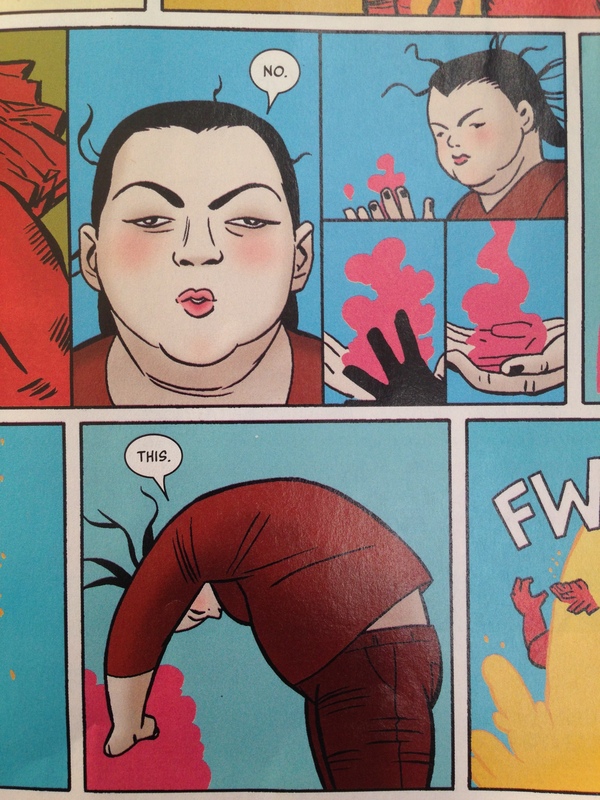 Studios; Review by Lilith Wood; ‘Rama Rating; 3 out of 10): Memetic #2 tells the story of a destructively fascinating image, but fails to fascinate. This mash-up of social media culture and the zombie apocalypse genre adds up to less than the sum of its parts. Eryk Donovan’s art style of cartoonishly large heads on small bodies suggests wit or at least fun, but James Tynion’s wooden dialogue makes every character seem dimwitted. Tynion writes jokes that fall flat and serious scenes that are tone-deaf to the point of being unintentionally funny. 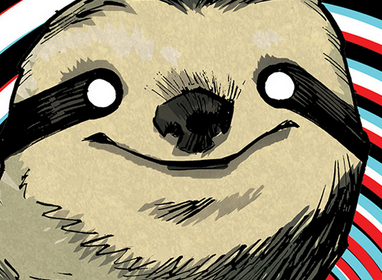 At the beginning of Memetic #2, one character is traumatized after watching his brothers tear apart his mother. In the process of supposedly comforting him, the man’s boyfriend says, “You’re the only one who I’ve ever felt like myself around.” This makes no sense for how people behave, and the story goes downhill from there.